Date Added: Sunday 15 January, 2012 by Paul W.
Recieved my suit the 2nd week in December, about 4 weeks after placing the order. And what a fantastic suit. I was a bit concerned about ordering a suit "online", but I did not need to worry. The suit fits perfectly and makes me feel like a million dollars. Can't wait to order another suit from Magnoli. Many thanks!.. 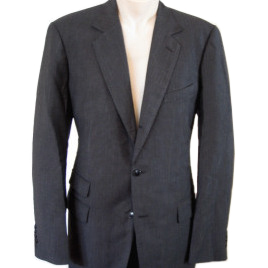 Date Added: Tuesday 11 May, 2010 by Casey P.
Date Added: Sunday 29 November, 2009 by Josh N.
I was a little concerned about buying a Made To Measure suit online, but after receiving this suit, all my worries were put to rest. As long as the measurements are correct, this will fit like a glove! The suit looks amazing, and my friend who is a personal stylist loves it. Thanks Indy!.. Date Added: Friday 19 June, 2009 by David R.
Date Added: Tuesday 10 February, 2009 by steve f.